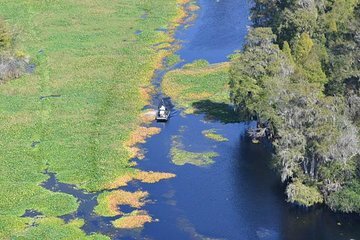 Experience the beauty of Tampa, Busch Gardens, and the Alafia River from the air on this guided helicopter tour. Fly over the waterfront mansions on the Davis Islands toward the city’s skyscrapers downtown. Then zoom over Busch Gardens Tampa Bay, home to some of the world’s most exotic animals and the Alafia River in search of wildlife in the water. It’s a sight for scenic eyes—an unforgettable, bird’s eye view of Tampa’s urban environment and the varied wildlife that surrounds it. Your departure time is flexible—depart any time of day! This helicopter tour around and over Tampa Bay begins at the Peter O. Knight Airport on the Davis Islands, five minutes from downtown Tampa. Take off to the west of the city and enjoy a view of the most elaborate homes on the islands, including Bayshore Boulevard, as the helicopter turns north towards Tampa’s downtown skyline. Check out magnificent views from just above rooftop level. There’s Amalie Arena, home for ice hockey, basketball, arena football games, and concerts; the Florida Aquarium, one of the top aquariums in the country; the University of Tampa and all the city’s skyscrapers—like Bank of America Plaza, 100 North Tampa, and One Tampa City Center. Continue North over Ybor City and the Hillsborough River on the way to Busch Gardens Tampa Bay, a 335-acre, African-themed animal theme park with roller coasters and some of the world’s most exotic animals including cheetahs, rhinos, gorillas, elephants, giraffes, and many more. Then return to downtown Tampa again before flying low over Port Tampa Bay to look for wildlife like blue herons and alligators in the 25-mile-long Alafia River. From there, it’s back to the Peter O. Knight Airport to conclude this unique and unforgettable tour of Tampa, Busch Gardens and the Alafia River. This was a very successful birthday surprise for a friend. We saw dolphins, flew over roller coasters and cruise ships. Our pilot was great. It was a really cool experience!